Wet to dry. Open woods, prairies. Full or partial sun. This is a 4″ to 12″ tall, erect, perennial forb that is easy to overlook if not in bloom. There is no above-ground central stem. A whorl of leaves and a flowering stalk rise from a small, solid, vertical, thickened, underground stem (corm). The 3 to 6 grass-like leaves are linear, up to 1′ long and ½″ wide, and have scattered long, soft, straight hairs. One or more leafless stalks (scapes) support irregular, umbrella-like inflorescences (umbels) of 2 to 6 flowers each, with the flower stalks arising from more or less the same point. The scape also has scattered hairs and is shorter than the leaves. It can be up to 8″ in height, but is rarely more than 6″. 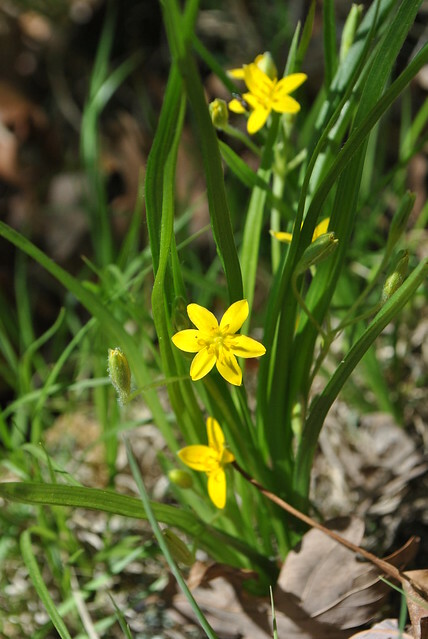 The star-like flowers are ½″ to 1″ across and have 6 tepals that spread outward. 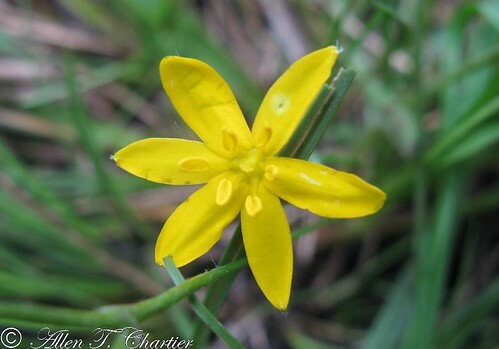 The tepals are 3 petals and 3 sepals. The underside of the sepals and the flower stems are densely hairy. There are usually only one or two flowers open at a time. The flowers open in the morning then melt in the midday sun. There are no similar species in the state. 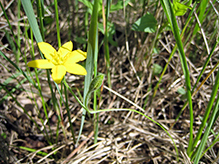 The six petals and hairy stems of this plant are distinctive. 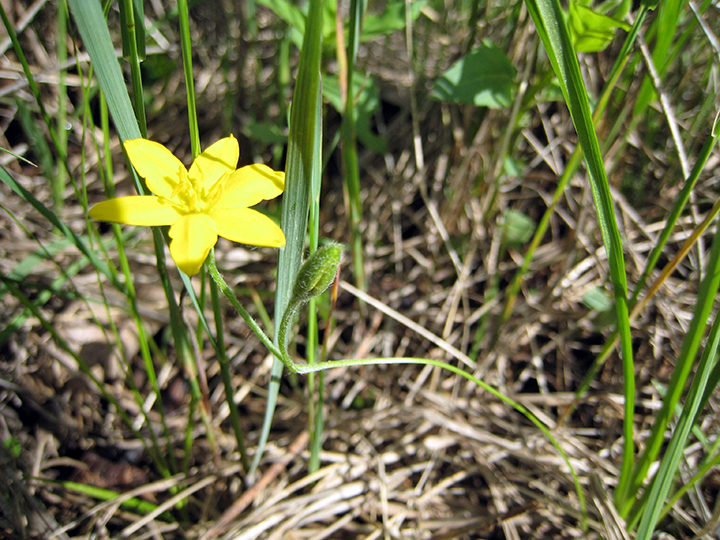 This is the only Hypoxis species found in Minnesota. A flat-topped or convex umbrella-shaped cluster of flowers or buds arising from more or less a single point. 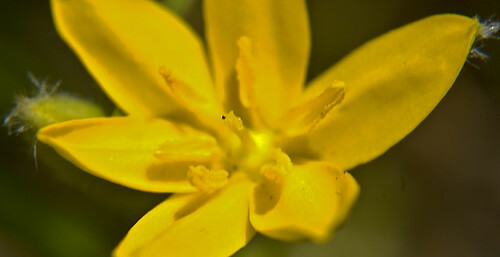 Observe the native bee interacting with the anthers of yellow star grass. 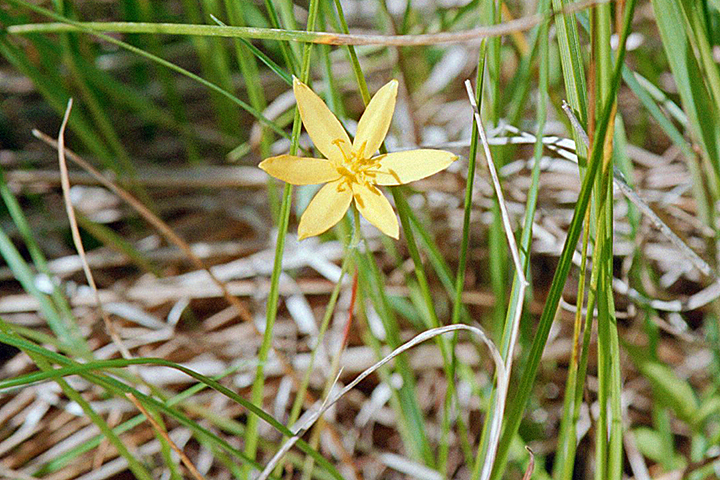 This native bee is foraging on yellow star grass. This video was recorded during May, 2013, at Cuivre River State Park in Missouri.